The Sun-Herald City2Surf presented by Westpac is the LARGEST fun run in the world and we know we have an impact on Sydney – the people, the city and of course the environment! That’s why we work closely with local councils, event and supply partners to reduce our waste. We are endeavouring to reduce and remove our cups from landfill for 2018 and the future. Thanks to our good friends at Clean Oceans, BioPak, Dial A Dump and a local composting facility we have something exciting happening with our cups this year…. We have teamed up with BioPak for our on course compostable, we repeat – compostable – cups, Dial A Dump will collect and transport the cups to a local composting facility who will compost all of the cups! How great is that?! Yay #Change. Check out what we achieved at The Sydney Morning Herald Half Marathon with BioPak and Dial A Dump. BUT, we know we can do more and we are! We have some more fabulous friends helping us out on this one – Clean Oceans. 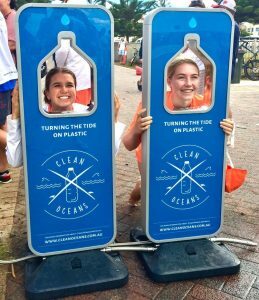 Clean Oceans are an education program designed to change the purchasing behaviour of young Australians. Did you know it is predicted by 2040 there will be more plastics in the ocean than marine life? 15,000 plastic bottles are thrown away every minute in Australia. SO, help us to do something about this and let’s make a #change together. BYO drink bottle or purchase a Clean Oceans stainless steel drink bottle at the start or finish zones. Refill your drink bottle at the start and finish where Clean Oceans are providing self serve filtered refill stations! AHmazing right?! To ensure all of your hydration needs are met you can ask any of our drink station volunteers on course to refill your bottle too. We are super excited to be working with Clean Oceans and they are excited to work with us too! 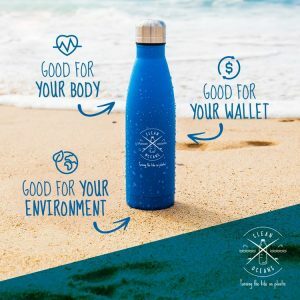 “It is heartening to see that such a big event and company (Fairfax Media) is putting their hand up to help fight the battle to reduce waste on our Planet… that really excites all of the Clean Oceans tea. Our partnership will allow us to spread our message to a huge number of people. Clean Oceans is an education, prevention and healthy living program which we believe really aligns with the City2Surf event” – Brett Pattinson, Co-Founder of Clean Oceans. Help us help Clean Oceans turn the tide on plastics from entering our oceans. But wait, there’s more – we are so pleased to share that our event partners also have their own initiatives taking place too!